The Iraqi Army recaptures Ramadi, Hīt, Ar-Rutbah, and Fallujah from ISIL. 20 percent of the Anbar Province, and 25 percent of Anbar's population remain under ISIL control. Middle East Eye, citing Iraqi military sources: Reported that over five-week battle of Fallujah, 2,500 ISIL militants were killed and 2,186 were arrested. The Anbar campaign (2015–16) was a military campaign launched by the Iraqi Armed Forces and their allies aimed at recapturing areas of the Anbar Governorate held by the Islamic State of Iraq and the Levant (ISIL), including the city of Ramadi, which ISIL seized earlier in 2015. The United States and other nations are aiding Iraq with airstrikes. On May 17, 2015, ISIL captured the city of Ramadi, after launching multiple waves of suicide attacks during a sandstorm, which caused Iraqi forces to retreat from the city. On the dawn of July 13, the Iraqi Army, backed by the Shiite and Sunni pro-government militias, launched an assault on several fronts in Anbar, including on Ramadi. According to the police sources in the province, the Iraqi forces pushed towards Ramadi from the west and the south. According to ISIL supporters, the advances of the Iraqi forces were repelled by militants. By the afternoon, the Iraqi Army retook the Ramadi Olympic stadium in western Ramadi and reached the eastern part of the city. According to Iraqi officials, pro-government fighters also pushed the extremists from the areas east of Ramadi. On July 20, the Olympic stadium was destroyed by ISIL militants with remotely detonated explosives. According to military officials said that there may have been number of Shiite militia fighters may have been inside the stadium at the time of its destruction, but they did not offer casualty figures. On July 23, Iraqi government announced that it had deployed United States-trained Iraqi troops for the first time to retake Ramadi. The Shiite militia commanders said that currently the initial main focus was on retaking Fallujah rather than Ramadi and the Iraqi government indicated that will not be used to liberate Ramadi. On July 26, pro-government forces took back the complete control of University of Anbar from ISIL fighters. It was retaken by forces from Iraq's Counter Terrorism Services with support from the Iraqi army and air support from the international coalition and Iraqi aircraft. On July 29, 12 Iraqi soldiers were killed when ISIL suicide attackers rammed 2 explosive-laden Humvees into forces deployed outside the university's compound. On August 11, a senior official with the US-led Coalition said that Iraqi forces had surrounded the city and were preparing for a final assault to retake it. On August 23, 23 Iraqi soldiers including 17 Iraqi military soldiers and 6 allied Sunni fighters were killed by ISIL in an attack that involved the use of suicide bombers and artillery. On August 25, Iraqi forces repelled an ISIL suicide attack west of Ramadi by destroying three booby-trapped vehicles and killing everyone inside them. On August 27, 2 Iraqi army generals and 3 soldiers were killed in a suicide attack while 10 other soldiers were wounded. On September 10, an airstrike by the US-led coalition destroyed an ISIL operating base and staging area in a stadium near Ramadi. On September 15, it was reported that a force of 160 US troops had arrived at Habbaniyah air base and were expected to help the Iraqi army retake Ramadi. The unconfirmed reports also noted that USA agreed to take part in ground combat against ISIL if the Popular Front forces withdrew from Anbar. However, these reports were dismissed by an Iraqi army spokesman who said that the US troops at the air base were there to simply provide military advice and coordinate raids against ISIL targets. Popular Front spokesman Karim Al-Nouri also dismissed these reports saying that the Popular Front militia was still deployed in Anbar. By late September, the operation to retake Ramadi was considered to have stalled, with Iraqi security forces positioned on the outskirts of Ramadi, but unable to mount an incursion into the city. Political squabbles between Iranian backed militias and the Abadi administration were also hampering potential offensives. On September 25, the United States urged the Iraqi Army to hasten the operation, acknowledging that "...the Iraqis have not made any significant forward movement recently." On October 7, Iraqi forces renewed their operations in Ramadi, capturing several areas to the north and west, including the main road west of Ramadi. By October 13, Iraqi troops had advanced 15 kilometers and encircled the city according to US officials. Further Iraqi military reinforcements including artillery batteries and tanks arrived in the nearby town of Khaldiyah on November 10, in preparation for another assault on Ramadi. Iraqi forces recaptured the emergency directorate headquarters in Ramadi on November 14. On November 25, Iraqi forces launched the offensive to recapture Ramadi, cutting ISIL's last supply line into the city of Ramadi, via the Euphrates River, by seizing the strategic Palestine Bridge. On December 8, Iraqi forces pushed into the city, and Iraqi forces captured Tamin, a key district in the south-western area of Ramadi. The Iraqi Army also recaptured the Anbar Operation Control Center, near the Palestine Bridge. On December 10, ISIL forces blew up the Warrar Dam, which linked the Anbar Operations Control Center to northwestern Ramadi city, leaving the Qassim Bridge as the last working bridge in Ramadi. On December 22, Iraqi forces advanced into the center of the city of Ramadi, and headed towards the main government complex. The attack was launched from al-Tamim and al-Humaira Districts in the southwest and south, northwards on 3 axes into the central al-Hoz District, and the Andalus and al-Malab Districts further east. On December 27, the Iraqi Army captured the government complex, after which they declared victory in Ramadi, and claimed to be in full control of the city center. However, on the following day, it was confirmed ISIL was still in control of 30 percent of the city. On December 30, 2015, the Iraqi Prime Minister visited Ramadi and raised the Iraqi flag at the government complex. ISIL casualties during the battle were reportedly high, while Iraqi Army casualties were low. On January 3, 2016, the Iraqi Government declared that it had recaptured 80% of Ramadi city, and that the only pockets of ISIL resistance remaining were located in the al-Malab and 20th Street areas of the city. On January 20, the city of Ramadi was reportedly cleared of ISIL forces, after over 6 months of fighting. Iraqi forces began moving eastward to Khalidiya Island, after clearing ISIL-held neighborhoods near the area. On January 21, US Vice President Joe Biden congratulated the Iraqi Security Forces for liberating the city of Ramadi from ISIL control, during a meeting with Iraqi Prime Minister al-Abadi. On January 22, Iraqi forces fully entered the Sajjariyah District, and they also entered the ISIL-held areas in the Joabah and Husaiyah Districts, to the east of Ramadi. On January 23, ISIL launched suicide attacks in the Kilo 70 area west of Ramadi, and in the Tal Msheheidah east of Ramadi, as well as areas to the north of Ramadi; the ensuing clashes and airstrikes led to the deaths of 62 ISIL militants and 48 Iraqi fighters. On January 24, Iraqi Defense Minister said that the Iraqi Army was preparing for an offensive on Mosul, stating that the Iraqi Army and Coalition forces had defeated ISIL in Ramadi. Later on the same day, 190 people suspected of collaborating with ISIL were arrested in Ramadi, even as fighting shifted to the Husaiybah District, to the east of Ramadi. On January 26, the Iraqi Army found and destroyed the ISIL headquarters in eastern Ramadi, in the al-Sofiyah District, killing at least 6 ISIL militants. During the next week, as the Iraqi Army closed in on the Sajjariyah District, the last area in Ramadi held by ISIL, ISIL launched multiple waves of suicide attacks in the Ramadi area, killing dozens of Iraqi soldiers. On February 4, 2016, the Iraqi Army recaptured the Sajjariyah District, fully expelling ISIL from Ramadi. The 2015–16 Battle of Ramadi was the first time since the Fall of Mosul in which the Iraqi Army played the primary role in combating ISIL. On February 1, the Iraqi Army launched an offensive on the Khalidiya Island area, which is the region located between the villages Albu Nasir and Albu Shajal, situated between Ramadi and Fallujah. On the same day, the Iraqi Army managed to capture the villages of Albu Shalib and Albu Shajal, to the northwest of Fallujah. On February 2, the Iraqi Army fully severed the last supply lines between the Khalidiya Island region and the city of Fallujah, completely besieging the city. This led to concerns that an estimated 30,000 civilians trapped in Fallujah would starve, due to the lack of airdropped supplies into the city. On February 4, after Ramadi city was recaptured from ISIL, offensive operations shifted further eastward to the Khalidiya Island area. On February 8, the Iraqi Army recaptured the Juwaybah District, to the east of Ramadi, east of the Sajjariyah District. On February 9, Iraqi forces entered the center of Husaiybah, the last ISIL-held village to the east of Ramadi. Later on the same day, the Iraqi Army fully recaptured the Husaiybah Al-Sharqiyah District, about 10 kilometers (6 miles) east of Ramadi, thus fully expelling ISIL from the environs of Ramadi. Dozens of ISIL militants were killed in the clashes in Husaiybah. The Iraqi Army also began evacuating 1,500 civilians from the Husaiybah Al-Sharqiyah District. Afterwards, the Iraqi Government reopened the Ramadi-Habbaniyah Highway. ISIL militants were still holed up in some farmlands in Khalidiya Island, to the north of the town of Al Khalidiya. On February 10, it was reported that the Iraqi Army had fully recaptured the Khalidiya District, including the Khalidiya Island area, but there was renewed fighting in Khalidiya Island area since March 2016. Because there was still resistance in the area, the army started a new offensive on May 25, 2016. On February 14, an Iraqi airstrike killed an ISIL commander in the Kartan area of the Khalidiya District, along with 14 other ISIL militants. Later on the same day, the Iraqi Government reported that the Sedikiyah area in the eastern Khalidiya District was ready for the return of displaced civilians, after IEDs left behind by ISIL in the area had been dismantled. On February 16, the Iraqi Army launched a clearing operation in the Hamidiyah District, to the northeast of Ramadi's Albu Ghanem District. On February 19, the Iraqi Army completely cleared the Hamidiyah District from ISIL forces, killing dozens of ISIL fighters. On February 21, the US-led Coalition bombed an ISIL gathering in Khalidiya Island, killing 7 ISIL leaders. From February 15 to 19, the Iraqi Army launched an offensive into the town of Al-Karmah, to the northeast of Fallujah, killing dozens of ISIL militants. On February 18, a large number of local Sunni tribesmen revolted against ISIL, after ISIL beat a woman, among other restrictive practices enforces by ISIL's Al-Hisbah secret police, amid an ongoing siege. ISIL was reported to have withdrawn into Fallujah city, after local Sunnis burned the Al-Hisbah headquarters and clashes spread. On February 20, the clashes began to die down as ISIL began carrying out mass arrests, and it was reported that there were still some Sunni fighters who were pinned down in parts of Fallujah, who would likely be massacred if the Iraqi Government or the US-led Coalition does not intervene. On February 21, the Iraqi Army began shelling ISIL positions on the outskirts of Fallujah, in support of the Sunni tribal fighters. Late on February 21, ISIL crushed the revolt, and detained 180 men. However, on the same day, the Iraqi Army deployed reinforcements to Fallujah, in preparation to storm the city. On February 23, the Iraqi Army fully recaptured the town of Al-Karmah, after they destroyed ISIL's last stronghold in the town. On February 25, the Iraqi Governor of Anbar stated that the battle for Fallujah would begin soon, and that it would be much shorter than the battle for Ramadi. On February 27, the Iraqi Government reported that 600 ISIL fighters had managed to flee Fallujah to nearby areas, and to the city of Mosul. On February 28, the Shi'ite militia forces repelled an ISIL attack on Al-Karmah, which was described as one of the largest attacks on the town. Later on the same day, Iraqi government forces repelled a massive ISIL suicide attack in Abu Ghraib and western Baghdad, which was the largest attack carried out by the group in the area in nearly 2 years. The assault left 30 ISIL militants and 30 Iraqi soldiers dead. The Iraqi army carried out an offensive on the city of Fallujah liberated the hospital and captured al-Karmah on May 23, 2016. On June 26, 2016 the Iraqi Army liberated Al-Fallujah after liberating the last ISIS held neighborhood of Al-Jolan. On February 19, it was revealed that the next target of Iraqi operations in the Anbar Province was going to be the town of Hīt, with an estimated 12,000 civilians and 300–400 ISIL militants in the town, and many more ISIL militants in the surrounding area. On February 23, the Iraqi government deployed reinforcements to the Ain al-Assad airbase near Hīt, in preparation for a future offensive to recapture both Kabisa and the Hīt District from ISIL. On the same day, clashes erupted between local Sunni tribesmen and ISIL forces in the Hīt District. On the next day, the US-led Coalition destroyed the ISIL headquarters in Hīt and Kabisa, killing multiple ISIL militants. On February 28, the Iraqi government warned the civilians in Kabisa and the Hīt District to leave within 48 hours, to avoid an imminent offensive to recapture those areas. On March 12, the Iraqi Government launched the offensive to recapture the Hīt District, also known as Operation Desert Lynx. On the same day, U.S.-led Coalition forces conducted several airstrikes within Hīt, killing a number of ISIL leaders and militants, which Iraqi officials confirmed. On March 17, Iraqi Security Forces and their allies drove ISIL forces out of al-Mohammadi, located southeast of Hīt. On March 21, the Iraqi Army came within 1 kilometer of the eastern outskirts of Hīt. On the same day, Iraqi forces paused offensive operations, to give the remaining civilians in the district time to flee. On March 19, the Iraqi Army recaptured the town of Kabisa, to the west-southwest of Hīt. On April 1, the Iraqi Army recaptured the northern edge of the city. The offensive was reported to have been delayed earlier, because hundreds of roadside bombs littering the surrounding area slowed progress for days. Furthermore, it was reported that a significant number of troops had been pulled out of Al Anbar Governorate earlier to protect protesters in Baghdad, which also resulted in delays. On April 5, it was reported that the Iraqi Security Forces had recaptured more than 70% of the Hīt District. The state TV reported a local commander saying that the military had routed ISIL from the city, but that fighting was still going on. The Iraqi Army's control of the town appeared to be incomplete and fragile. An Iraqi commander informed that the insurgents had tried to retake a main street but were repelled. Iraqi forces also managed to seize the government compound and raised the Iraqi flag on a main building, after ISIL militants withdrew from the downtown and eastern part of the town. On April 8, Iraqi forces recaptured the Hit town center, and expelled ISIL forces from most of the city, but fighting still continued in the city. At least 30 Iraqi soldiers were killed, and more than 50 were wounded in the clashes. On April 14, Iraqi forces fully recaptured the town of Hīt, along with the remainder of the Hīt District. On March 13, a senior Iraqi general reported that ISIL has fully withdrawn from the city of Ar-Rutbah to Al-Qa'im, after they began leaving the night before. The withdrawal was confirmed by a member of Anbar's security council. It was also reported that ISIL had abandoned the town of Kabisa as well, and they had also withdrawn from Hīt to some degree, with Iraqi warplanes bombing the retreating militants. This was the first time that ISIL has withdrawn from a major urban area without an actual fight, and the retreat came after recent losses on the battlefield for ISIL in Syria and in the Anbar Province, including a recent offensive on Hīt. However, ISIL returned to the town on the following day. On May 16, the Iraqi Army launched an offensive to recapture the town of Ar-Rutbah, and the rest of the Ar-Rutba District. The Iraqi Army attacked the town from three directions. A US official stated that Ar-Rutbah wasn't as well defended by ISIL as Ramadi or Fallujah, and that there were 100 to several hundred ISIL militants based in the town. On May 17, the Iraqi Army fully recaptured Ar-Rutbah, and the surrounding areas in the Ar-Rutbah District. During the clashes, at least 4 Iraqi soldiers were killed and 5 more were wounded, and around 100 ISIL fighters were killed. On May 22, 2016, the Iraqi Army published a statement and asked residents of the battlefield to leave the area through secured routes. The Iraqi Army also said that local residents who could not move should raise white flags on top of their roofs. Haider al-Abadi ordered to beginning the operation on the early Monday of 23 May. "The Iraqi flag will be raised high over the land of Fallujah." al-Abadi said. On May 23, 2016 it was reported the city of Al-Karmah was recaptured by Shiite militias of PMF. Photos published by a PMF media shows Iran's Quds Force commander Qassem Suleimani and other PMF commanders discussing Fallujah battle strategies. On the first day of the offensive 11 further villages and districts near Fallujah were recaptured, which forced ISIL fighters to retreat to the interior of the strategically important city. The offensive was slowed down because in the outskirts hundreds of improvised explosive devices were found. The Popular Mobilization Forces declared on 23 May that they had captured Al-Karmah, about 16 kilometers (10 miles) northeast of Falluja, which brings most of the territory east of Falluja under government control. They also announced the liberation of al-Harariyat, al-Shahabi and al-Dwaya and the killing of 40 ISIL militants during the military operation. Iraqi government announced that pro-government fighters had captured the villages of Luhaib and Albu Khanfar on 24 May. On 25 May, 16 villages and districts on the eastern outskirts of Fallujah were cleared by the Iraqi Security Forces. Included in this were the gains from a column in the North-East, which liberated the town of Sejar days after the capture of Al-Karmah. These clashes resulted in the death of 40 ISIL militants. An additional 163 ISIL militants, 15 civilians and 35 Iraqi forces and militiamen were killed in clashes which gained the Iraqi army control over the remaining districts in the South-East, allowing them to create a corridor that cut the ISIL-controlled-zone in two. During the day, it was reported an Iranian Basij member was killed in fighting near Fallujah. According to Qasm Araji, a member of the defense committee, the advancing forces are continuously gaining ground and "nearing Fallujah's Eastern gate." On 27 May, the US-led coalition conducted airstrikes in and around the city. US-led coalition air and artillery strikes airstrikes in and around Fallujah killed 70 ISIS fighters in Fallujah, including the top commander in the area, Maher Al-Bilawi  On 28 May, the Iraqi Army declared the start of an operation to liberate Fallujah's city center, considered to be ISIL's stronghold in the western province of Anbar. Early on 30 May, the Iraqi forces began entering the city of Fallujah from 3 directions, and captured the village of Saqlawiyah. However, the Iraqi forces faced very stiff resistance from the ISIL forces inside of the city, slowing their advance. By June 26, Fallujah had been declared "fully liberated" by the Iraqi army. From June 29 to 30, the US-led Coalition and the Iraqi Air Force bombed large convoys of ISIL vehicles fleeing the Ramadi, Khalidiya Island, and Fallujah areas, after ISIL's recent defeat in Fallujah. The airstrikes destroyed over 150 vehicles and killed at least 360 ISIL militants. Iraqi Army along with the local tribes launched a new offensive on 5 January 2017 to capture the remaining areas under ISIL control in Anbar with the main targets being the towns of Aanah, Rawa and Al-Qaim. The operation was however suspended after retaking of Sagra and Zawiya because of preparations for recapturing western bank of Mosul. Iraqi forces began a new offensive to dislodge the group from the area along the border in September 2017. ^ Susanna Capelouto and Hamdi Alkhshali, CNN (December 23, 2015). "Iraqi forces closing in on ISIS in Ramadi - CNN.com". CNN. ^ "Roadside bombs slow Iraqi forces' advance on Ramadi". ^ Jean-Dominique Merchet, Irak : la participation française à la bataille de Ramadi, l'Opinion, December 30, 2015. ^ David Pugliese, Canadian CF-18s supporting Iraqi efforts to retake Ramadi, Ottawa Citizen, December 11, 2015. ^ a b c "Voices: A heartening victory over the Islamic State". USA TODAY. January 19, 2016. Retrieved February 5, 2016. ^ a b c "Iraq's Ramadi retaken, but rebuilding it a huge task". Yahoo News. February 9, 2016. Retrieved March 24, 2016. ^ a b "Iraqi forces 'recapture IS-held town of Hit' - BBC News". Retrieved June 26, 2016. ^ a b Amre Sarhan (May 18, 2016). "Security forces fully liberate al-Rutba District, announces Anbar Operations". Iraq news, the latest Iraq news by Iraqi News. Retrieved May 18, 2016. ^ "20 pc of Anbar still under ISIS control: Governor Rawi". Iraqi News. July 25, 2016. ^ "Isis head Abu Bakr al-Baghdadi in Ramadi to fight Iraqi forces, replaces foreign leaders with locals". International Business Times, India Edition. October 5, 2015. Retrieved February 5, 2016. ^ Reuters Editorial (January 7, 2016). "Iraq military says ISIS spokesman Adnani wounded: state TV". Reuters. Retrieved February 5, 2016. ^ Abdelhak Mamoun (January 6, 2016). "URGENT: ISIS War Minister killed in aerial bombing in Barwana". Iraq news, the latest Iraq news. Retrieved January 9, 2016. ^ "IS Governor of Anbar killed in Airstrike". Retrieved March 24, 2016. ^ Abdelhak Mamoun (February 20, 2016). "ISIS new Wali of Anbar killed in aerial bombing west of Ramadi". Iraq news, the latest Iraq news by Iraqi News. Retrieved March 24, 2016. ^ "Iraqi forces plan to retake Mosul from Daesh after battle for Ramadi is complete". Al Bawaba. Retrieved February 5, 2016. ^ Krishnadev Calamur. "Iraqi Military Spokesman Says Ramadi Is 'Fully Liberated'". The Atlantic. Retrieved February 5, 2016. ^ a b "Ramadi battle: Shia militias near IS-held Iraqi city". BBC News. Retrieved February 5, 2016. ^ "Celebrating Victory Over ISIS, Iraqi Leader Looks to Next Battles". The New York Times. December 30, 2015. Retrieved February 5, 2016. ^ "'Squad-size' ISIS units remain in Ramadi". Military Times. January 6, 2016. ^ Iraq civilians killed fleeing ISIL clashes in Ramadi, Al Jazeera (January 17, 2016). ^ a b "Over 100 killed in air strikes, clashes with IS militants in Iraq". Xinhua. January 23, 2016. ^ ISIL kills dozens of Iraqi soldiers near Ramadi, Al Jazeera (January 27, 2016). ^ Iraq blames ISIL for deadly attacks on troops, Al Jazeera (February 4, 2016). ^ ISIS attacks kill 31 Iraqi soldiers in two days, Rudaw (March 2, 2016). ^ ISIL attacks kill 47 Iraqi soldiers near Ramadi, Al Jazeera (March 14, 2016). ^ "US says airstrikes have killed 350 Isis fighters in western Iraq city Ramadi". the Guardian. Retrieved February 5, 2016. ^ "Iraqi tribal force announces death of 700 ISIS militants in recent clashes in Anbar". ARA News. Retrieved February 5, 2016. ^ "EXCLUSIVE: Iraqi troops' heavy toll for Fallujah victory is revealed". ^ a b Loaa Adel (January 24, 2016). "Anbar police arrests 190 suspects of links with lSIS in Ramadi". Iraq news, the latest Iraq news by Iraqi News. Retrieved February 5, 2016. ^ a b c "Iraqi, allied militias advance on Fallujah; new tactics squeeze ISIS". Rudaw English. Retrieved May 25, 2016. ^ Stephen Kalin (January 10, 2016). "Bombs laid by Islamic State hamper Iraqi troops in Ramadi after victory". Reuters. Retrieved February 5, 2016. ^ Stephen Kalin (January 18, 2016). "Ramadi civilians force Iraq to adjust fight against Islamic State". Reuters. Retrieved February 5, 2016. ^ a b Loaa Adel (February 9, 2016). "Anti-Terrorism forces evacuate 1500 civilians from Husaibah". Iraq news, the latest Iraq news by Iraqi News. Retrieved March 24, 2016. ^ "Iraq civilians killed fleeing ISIL clashes in Ramadi". Al Jazeera. Retrieved February 5, 2016. ^ "Daesh terrorists kill 40 Iraqi citizens north of Ramadi". Shahernama. Archived from the original on January 29, 2016. Retrieved February 5, 2016. ^ "Iraq says 40 bodies found in mass grave in Ramadi". Military Times. January 26, 2016. Retrieved February 5, 2016. ^ Loaa Adel (February 16, 2016). "Mass grave containing 50 bodies discovered in eastern Ramadi". Iraq news, the latest Iraq news by Iraqi News. Retrieved March 24, 2016. ^ "Iraq launches offensive to drive Islamic State from biggest province". Reuters. Retrieved July 30, 2015. ^ Matt Bradley And Ghassan Adnan (July 13, 2015). "Iraq Security Forces Launch Operation to Oust Islamists From Anbar Province". WSJ. Retrieved July 30, 2015. ^ "ISIS Blows Up Iraqi Sports Stadium Near Ramadi". Newsweek. July 21, 2015. Retrieved July 30, 2015. ^ "Iraq deploys U.S.-trained troops to Ramadi fight for first time". Yahoo News. July 23, 2015. Retrieved July 30, 2015. ^ "Iraq forces retake university on edge of Ramadi". The Economic Times. Retrieved July 30, 2015. ^ "Suicide attacks kill at least 12 Iraqi troops near Ramadi". Al-Arabiya News. July 29, 2015. Retrieved January 5, 2016. ^ "Coalition says Iraqis close to taking Ramadi". USA TODAY. August 11, 2015. Retrieved December 20, 2015. ^ "New ISIS attack using suicide bombers and mortar shells kill 23 near Ramadi". Mail Online. August 23, 2015. Retrieved December 20, 2015. ^ Amre Sarhan. "Iraqi security forces repel ISIS attack west of Ramadi". Iraq news, the latest Iraq news. Retrieved December 20, 2015. ^ "Iraqi Army Generals Killed in ISIL Suicide Bombing - Al Jazeera America". Retrieved December 20, 2015. ^ "US-led coalition airstrike destroys Islamic State base in Iraq – video". the Guardian. September 11, 2015. Retrieved December 20, 2015. ^ "American fighting force of 160 'lands in Anbar province' in iraq to tackle ISIS". Mail Online. September 15, 2015. Retrieved December 20, 2015. ^ "Iraq denies US participation in ground battles in Ramadi". Middle East Monitor - The Latest from the Middle East. Retrieved December 20, 2015. ^ "No end in sight for Iraq fight against ISIS in Ramadi". MilitaryTimes. September 15, 2015. Retrieved December 20, 2015. ^ Loveday Morris (September 6, 2015). "The battle to retake Ramadi is going nowhere". Washington Post. Retrieved December 20, 2015. ^ "Iraq political dissaray slows Ramadi campaign". USA TODAY. September 21, 2015. Retrieved December 20, 2015. ^ Reuters Editorial (September 25, 2015). "U.S. urges Iraqi forces to move 'as quickly as possible' to retake Ramadi". Reuters. Retrieved December 20, 2015. ^ "Iraqi forces retake areas around Ramadi". Retrieved December 20, 2015. ^ "US, Iraqis ready to push ISIS out of Ramadi with air support". October 13, 2015. Retrieved December 20, 2015. ^ "Coalition Spokesman: Now Time for Push Into Ramadi". VOA. Retrieved December 20, 2015. ^ "Assault on Ramadi looms as dozens are killed across Iraq - UPI.com". UPI. November 10, 2015. Retrieved December 20, 2015. ^ "Iraqi army seizes emergency directorate HQ in Ramadi". Al Bawaba. Retrieved December 20, 2015. ^ "Iraqis launch offensive to retake Ramadi from ISIS". MilitaryTimes. November 26, 2015. Retrieved February 5, 2016. ^ a b "Iraqi Forces Fighting ISIS for Ramadi Push Toward City Center". The New York Times. December 23, 2015. ^ News Desk. "Iraqi Forces Cut Last ISIL Supply Line into Ramadi by Retaking Bridge". Al-Masdar News. Retrieved December 20, 2015. ^ "IS conflict: Iraqi forces 'retake key Ramadi district'". BBC News. Retrieved December 20, 2015. 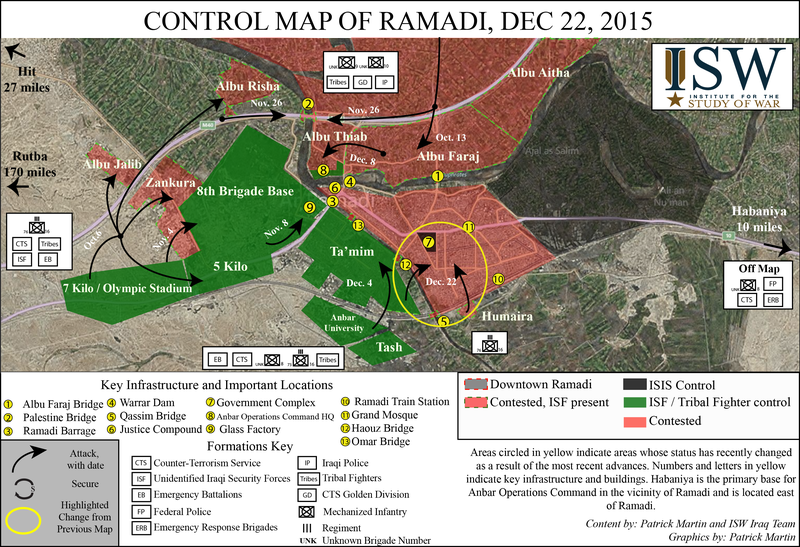 ^ "Control Map of Ramadi, Dec 22, 2015". Archived from the original on February 1, 2016. Retrieved January 24, 2016. ^ "ISIS Destroys Bridge as Iraqi Forces Close in on Ramadi". Military.com. Retrieved February 5, 2016. 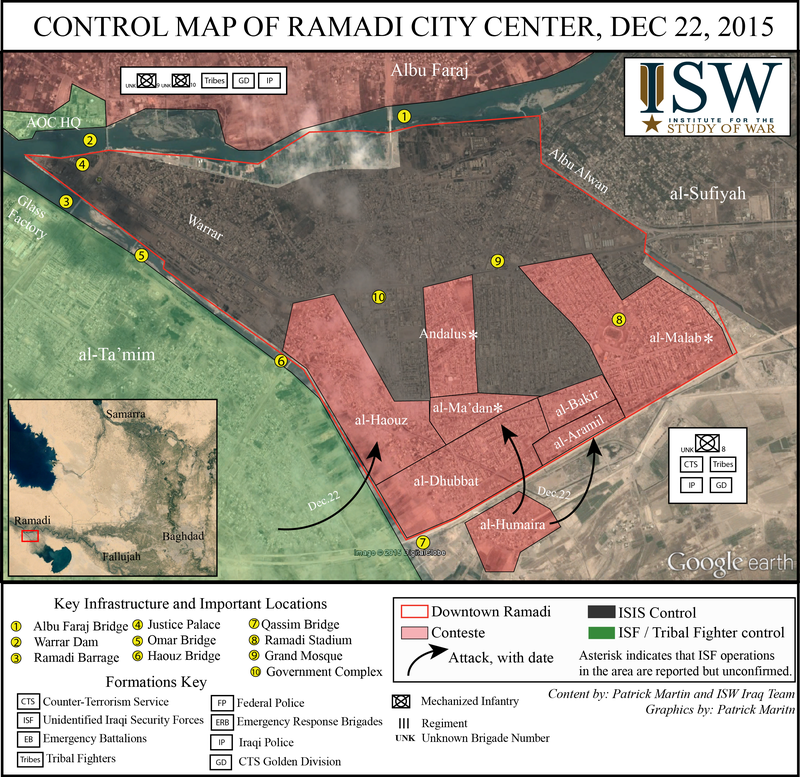 ^ a b "Control Map of Ramadi City Center, Dec 22, 2015". Archived from the original on February 1, 2016. Retrieved January 24, 2016. ^ "Iraqi forces 'advance into Islamic State-held Ramadi'". BBC News. Retrieved December 22, 2015. ^ Ahmed Rasheed and Maher Chmaytelli (December 27, 2015). "Iraqi army declares first major victory over Islamic State in Ramadi". Reuters. Retrieved February 5, 2016. ^ "Iraq forces in 'full control' of central Ramadi - BBC News". BBC News. Retrieved December 29, 2015. ^ ABC News. "International News - World News - ABC News". ABC News. Retrieved February 5, 2016. ^ "Islamic State suffers double blow as Ramadi falls, leaders killed". Reuters. December 30, 2015. Retrieved December 30, 2015. ^ Amre Sarhan (January 3, 2016). "Anbar police announces liberating 80% of Ramadi". Iraq news, the latest Iraq news by Iraqi News. Retrieved February 5, 2016. ^ Abdelhak Mamoun (January 20, 2016). "Security forces ready to cleanse Khalidiya Island east of Ramadi". Iraq news, the latest Iraq news by Iraqi News. Retrieved February 5, 2016. ^ "Readout of Vice President Biden's Meeting with Prime Minister Haidar Al-Abadi of Iraq". whitehouse.gov. Retrieved February 5, 2016. ^ Amre Sarhan (January 22, 2016). "Iraqi army forces advance into Joabah, Sajariyah and Husaiybah areas east of Ramadi". Iraq news, the latest Iraq news by Iraqi News. Retrieved February 5, 2016. ^ Amre Sarhan (January 24, 2016). "Iraqi forces are preparing to launch Mosul offensive, says Obeidi". Iraq news, the latest Iraq news by Iraqi News. Retrieved February 5, 2016. ^ Loaa Adel (January 24, 2016). "11 ISIS fighters killed, 4 defense sites destroyed east of Ramadi". Iraq news, the latest Iraq news by Iraqi News. Retrieved February 5, 2016. ^ Abdelhak Mamoun (January 26, 2016). "Security forces kill 6 ISIS fighters, destruct their headquarters in eastern Ramadi". Iraq news, the latest Iraq news by Iraqi News. Retrieved February 5, 2016. ^ Loaa Adel (January 28, 2016). "Anti-Terrorism Bureau announces liberation of 95% of Ramadi". Iraq news, the latest Iraq news by Iraqi News. Retrieved February 5, 2016. ^ "ISIL kills dozens of Iraqi soldiers near Ramadi". Retrieved February 5, 2016. ^ "New ISIL attacks kill more than 30 Iraqi forces". www.aljazeera.com. Retrieved January 29, 2016. ^ Amre Sarhan (February 4, 2016). "Anbar Council announces liberating al-Sajariyah area east of Ramadi". Iraq news, the latest Iraq news by Iraqi News. Retrieved February 5, 2016. ^ Loaa Adel (February 1, 2016). "Army forces advance to liberate Albu Shehab & Albu Shagl areas in Khalidiya Island". Iraq news, the latest Iraq news by Iraqi News. Retrieved February 5, 2016. ^ "Iraq Situation Report: January 26 – February 1, 2016" (PDF). Retrieved June 26, 2016. ^ Amre Sarhan (February 2, 2016). "Security forces cut off ISIS supply routes between Fallujah and Khalediya Island". Iraq news, the latest Iraq news by Iraqi News. Retrieved February 5, 2016. ^ Loveday Morris (February 1, 2016). "Trapped by the Islamic State, Iraqis in Fallujah say they are going hungry, too". Washington Post. Retrieved February 5, 2016. ^ Abdelhak Mamoun (February 4, 2016). "Joint forces launch massive attack south-east of Mosul". Iraq news, the latest Iraq news by Iraqi News. Retrieved February 5, 2016. ^ Loaa Adel (February 8, 2016). "Security forces fully liberate Juwiba, raise Iraqi flag over its buildings". Iraq news, the latest Iraq news by Iraqi News. Retrieved March 24, 2016. ^ "Iraq army enters last ISIL stronghold in Ramadi". Retrieved March 24, 2016. ^ Leith Fadel (February 9, 2016). "Iraqi Army liberates all of Ramadi". Al-Masdar News. Retrieved March 24, 2016. ^ a b Stephen Kalin and Ahmed Rasheed (February 9, 2016). "Iraq's troubled finances slow efforts to rebuild Ramadi". Reuters. Retrieved March 24, 2016. ^ Abdelhak Mamoun (February 9, 2016). "Security forces liberate Husaibah area, kill dozens of ISIS fighters east of Ramadi". Iraq news, the latest Iraq news by Iraqi News. Retrieved March 24, 2016. ^ "Iraqi troops fully capture Ramadi". The Financial Express Online Version. Retrieved March 24, 2016. ^ Amre Sarhan (February 14, 2016). "ISIS military commander of Kartan killed in coalition strike east of Ramadi". Iraq news, the latest Iraq news by Iraqi News. Retrieved March 24, 2016. ^ Loaa Adel (February 14, 2016). "Khalidiya Council: Sedikiya area is ready for displaced people return". Iraq news, the latest Iraq news by Iraqi News. Retrieved March 24, 2016. ^ "Iraq Situation Report: February 12 – 17, 2016" (PDF). Archived from the original (PDF) on October 11, 2016. Retrieved June 26, 2016. ^ Amre Sarhan (February 19, 2016). "Anbar Operations announces liberating Hamediyah east of Ramadi". Iraq news, the latest Iraq news by Iraqi News. Retrieved March 24, 2016. ^ Abdelhak Mamoun (February 21, 2016). "7 ISIS leaders killed in coalition bombardment in eastern Ramadi". Iraq news, the latest Iraq news by Iraqi News. Retrieved March 24, 2016. ^ Abdelhak Mamoun (February 15, 2016). "Joint forces begin military operation to free Karmat Fallujah". Iraq news, the latest Iraq news by Iraqi News. Retrieved March 24, 2016. ^ Abdelhak Mamoun (February 19, 2016). "Security forces advance into Karmat Fallujah, kill dozens of ISIS fighters". Iraq news, the latest Iraq news by Iraqi News. Retrieved March 24, 2016. ^ a b Loveday Morris (February 20, 2016). "Is the Islamic State losing its grip on Fallujah?". Washington Post. Retrieved March 24, 2016. ^ Loveday Morris (February 19, 2016). "Islamic State faces new trouble in Fallujah as Sunni tribesmen revolt". Washington Post. Retrieved March 24, 2016. ^ NBC News. "ISIS Beating Woman Triggers Fallujah Clashes: Officials". NBC News. Retrieved March 24, 2016. ^ "Fighting In Iraq's Fallujah 'Stops After IS Group Seizes Residents'". RadioFreeEurope/RadioLiberty. Retrieved March 24, 2016. ^ Tamer El-Ghobashy (February 21, 2016). "Islamic State Reasserts Control Over Fallujah". WSJ. Retrieved March 24, 2016. ^ Abdelhak Mamoun (February 21, 2016). "Military reinforcements arrived in Fallujah, security forces prepare to storm the city". Iraq news, the latest Iraq news by Iraqi News. Retrieved March 24, 2016. ^ Abdelhak Mamoun (February 23, 2016). "9 ISIS suicide bombers killed while trying to attack security forces in Karma". Iraq news, the latest Iraq news by Iraqi News. Retrieved March 24, 2016. ^ Amre Sarhan (February 25, 2016). "Liberation of Fallujah will be faster than Ramadi, says Anbar Governor". Iraq news, the latest Iraq news by Iraqi News. Retrieved March 24, 2016. ^ "600 ISIS Fighters Flee Fallujah in Northern Iraq". February 28, 2016. Retrieved March 24, 2016. ^ Abdelhak Mamoun (February 27, 2016). "600 ISIS fighters fled from Fallujah to Mosul". Iraq news, the latest Iraq news by Iraqi News. Retrieved March 24, 2016. ^ Amre Sarhan (February 28, 2016). "Volunteer forces repel ISIS attack on al-Karma, Anbar". Iraq news, the latest Iraq news by Iraqi News. Retrieved March 24, 2016. ^ Tamer El-Ghobashy and Ghassan Adnan (February 29, 2016). "Islamic State Launches Attacks in Baghdad". WSJ. Retrieved March 24, 2016. ^ Fadel, Leith (May 23, 2016). "Breaking: Iraqi Army liberates Fallujah General Hospital". Al-Masdar News. Retrieved June 21, 2016. ^ Leith, Fadel (June 26, 2016). "Iraqi Army Officially liberate Fallujah". ^ Loveday Morris (February 19, 2016). "With Islamic State under pressure, Iraqi forces hope to reclaim city of Hit". Washington Post. Retrieved March 24, 2016. ^ Amre Sarhan (February 23, 2016). "Military reinforcements arrive in Assad base to participate in liberating Heet City, Anbar". Iraq news, the latest Iraq news by Iraqi News. Retrieved March 24, 2016. ^ Amre Sarhan (February 23, 2016). "Armed clashes erupt between tribal fighters and ISIS in Heet, Anbar". Iraq news, the latest Iraq news by Iraqi News. Retrieved March 24, 2016. ^ Loaa Adel (February 24, 2016). "ISIS headquarters in Heet & Kabisa destructed by coalition bombardment". Iraq news, the latest Iraq news by Iraqi News. Retrieved March 24, 2016. ^ Abdelhak Mamoun (February 28, 2016). "Security forces prepare to storm Heet and Kabisa, give residents 48 hours to leave". Iraq news, the latest Iraq news by Iraqi News. Retrieved March 24, 2016. ^ "Iraqi Security Forces, Anbar Tribes Launch Operation Desert Lynx To Liberate Hit". March 12, 2016. Retrieved June 26, 2016. ^ "U.S.-led coalition strikes ISIS Sharia Court in Iraq's Anbar, kills top leaders - ARA News". ARA News. Retrieved March 31, 2016. ^ "Security forces free village from IS militants in Iraq's Anbar". Xinhua. March 17, 2016. ^ "PressTV". Retrieved March 31, 2016. ^ Sarhan, Amre (March 21, 2016). "Security forces advance 1 km away from Heet, Anbar - Iraqi News". Retrieved June 26, 2016. ^ "Hit offensive halted by Iraqi Army". Rudaw. ^ Adel, Loaa (March 19, 2016). "Security forces liberate Kabisa vicinity south of Heet - Iraqi News". Retrieved June 26, 2016. ^ "Iraqi security forces control 70% of Heet, ISIS members besieged". AhlulBayt News Agency. April 6, 2016. ^ "Iraqi forces push Islamic State from western town of Hit - state TV". ^ "Iraqi forces oust ISIL from key Anbar town - AJE News". Aljazeera.com. April 8, 2016. Retrieved June 4, 2016. ^ Mamoun, Abdelhak (April 14, 2016). "URGENT: Iraqi joint forces liberate Heet District completely - Iraqi News". Retrieved June 26, 2016. ^ "Security forces expel ISIS from key district in Iraq's Anbar - ARA News". April 15, 2016. Retrieved June 26, 2016. ^ The New Arab & agencies (March 26, 2015). "Iraqi forces recapture key town from IS militants". Alaraby.co.uk. Retrieved June 4, 2016. ^ "ISIS pulls out of town in Iraq's Anbar: general". The Daily Star Newspaper - Lebanon. Retrieved March 24, 2016. ^ "IS jihadists pull out of several Iraq towns: officers". Yahoo News. March 13, 2016. Retrieved March 24, 2016. ^ "Anbar officials see voluntary ISIS withdrawal from some towns". Rudaw. Retrieved March 24, 2016. ^ "ISIS returns to Iraqi town, 24 hours after vacating it". Deccanchronicle.com. Retrieved June 4, 2016. ^ a b "Iraq launches operation to retake Anbar town | The National". Thenational.ae. Retrieved May 19, 2016. ^ Mamoun, Abdelhak. "Security forces start liberation operation of Rutba District from 3 axes Ar-Rutbah Offensive (2016)". Iraqi News. Retrieved May 19, 2016. ^ Mamoun, Abdelhak. "9 security members killed, wounded in battles of Rutba District". Iraqi News. Retrieved May 19, 2016. ^ "Baghdad Takes Rutba From Islamic State; Jordan-Iraq Commercial Route to Reopen (Video): Juan Cole". May 19, 2016. Retrieved June 26, 2016. ^ "Farsnews". En.farsnews.com. Retrieved May 27, 2016. ^ Hume, Tim. "Falluja offensive: Iraqi troops retake key town of Karma from ISIS". CNN.com. Retrieved May 28, 2016. ^ Salim, Mustafa. "Iraqi military claims advances in Islamic State-held Fallujah". The Washington Post. Retrieved May 28, 2016. ^ Ryan, Missy (December 14, 2012). "Mixed Iraqi force prepares for push into militant stronghold of Fallujah". The Washington Post. Retrieved May 28, 2016. ^ "Iraqi forces advance as Fallujah offensive begins". Kurdistan24. Retrieved May 25, 2016. ^ "خبرگزاری تسنیم - " حاج قربان نجفی" به جمع شهدای مدافع حرم استان گلستان پیوست". Retrieved June 26, 2016. ^ "ISIS leader of fallujah killed by US airstrike". The Independent. Retrieved May 27, 2016. ^ "Fallujah: Iraqi forces 'closing in' on ISIL-held city". Al-Jazeera English. Retrieved May 28, 2016. ^ CNN, Euan McKirdy and Joshua Berlinger. "ISIS fights Iraqi forces near Falluja, military says". Retrieved June 26, 2016. ^ "Iraqi Army Advances Into Islamic State Stronghold of Fallujah As Suicide Attacks Rock Baghdad - VICE News". Retrieved June 26, 2016. ^ Malas, Nour (May 31, 2016). "Iraqi Forces Begin Ground Assault on Fallujah". Retrieved June 26, 2016 – via Wall Street Journal. ^ "Iraq launches offensive on ISIL in Anbar province". The National. Retrieved January 6, 2017. ^ "After Mosul, Iraq's western Anbar next up in IS fight". Al-Monitor. Retrieved September 15, 2017. ^ "Iraq launches offensive near Syria border". The New Arab. Retrieved September 17, 2017. This page was last edited on 27 January 2019, at 01:56 (UTC).